monday morning mail… | i made it so. The bottom is a sheet of homemade paper with flower seeds mixed in so I can plant it directly in the ground and it will produce some lovely annuals to last me all season. 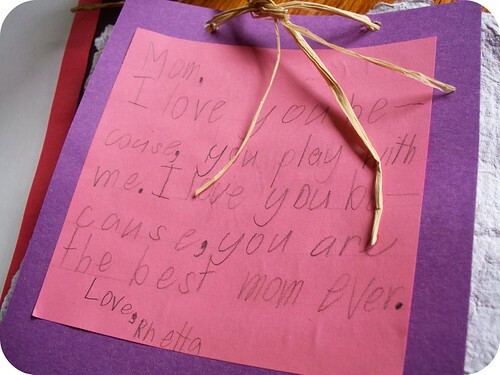 The top is two layers of colorful construction paper with a message from Rhetta written on the top. All are tied together with a string of rattan – is that what that stuff is called? It’s just lovely and I’m not going to plant it. If she’ll let me I’m gonna keep it like that forever. ? did you receive any adorable handmades this weekend from your kids? drop me a line and let me know. i may share it here, with your permission, of course! This entry was posted in 2D art, green thumb, ideas & inspiration, paper, you made it so and tagged cards, gifts, handmade, mothers day., paper, plantable paper, raffia, seeds. Bookmark the permalink. R’s note made my heart sing! 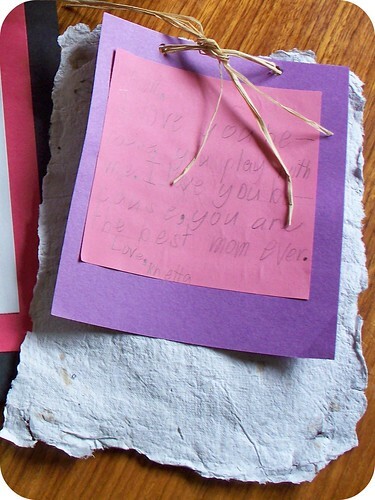 What a beautiful handmade Mother’s Day card. I’ve always wanted to make biodegradable seed paper, too! Ah, raffia! I knew it started with an R.